In spring 2017 our crew provided a much-needed shoring up of historic Cook Cabin in the Cataloochee area of the Great Smoky Mountains National Park. This past spring, we returned to the same valley for extensive renovation work on the park’s iconic Palmer Barn, which sees thousands of visitors each year. These projects both had simple beginnings: Keenly interested in the rich history of this particular spot in the Southern Appalachians, I saw a need and donated the services and expertise of our crew through these week-long service projects. This summer, we received thanks and kudos from many corners, from regional media coverage to recognition from the Friends of the Smokies, Park Superintendent Cassius Cash and at the annual Cataloochee Reunion in August. We’re glad to have had the opportunity to protect these venerable buildings and are grateful to those who’ve recognized our efforts. 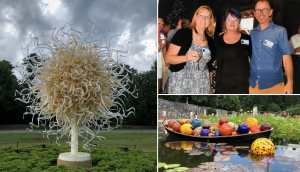 Recognized by Friends of the Smokies at its board meeting, held at Biltmore Estate, I got the added treat of seeing the Chihuly exhibit in its full glory. Photo, top right (pictured L to R): Libby Rose of Wandering Rose Travels – a Friends of the Smokies sponsor, Sean’s wife Chris Rhoades and Sean Perry.